TBEMC follows the Rabbinical Assembly’s triennial Torah reading cycle. 2018-2019 is the first year of the current three-year cycle. with 2019-2020 being the second year, and 2020-2021 the third year. Torah reading is generally done by congregants. If you would like to volunteer to read a particular Torah portion (or part of one), or if you would like to learn how to do so, please feel free to contact Art Werschulz (908-272-1146) or Laura Cohen (908-389-1744). Follow the links below to find a particular portion. And for more information on our Torah with Laura program, click here. 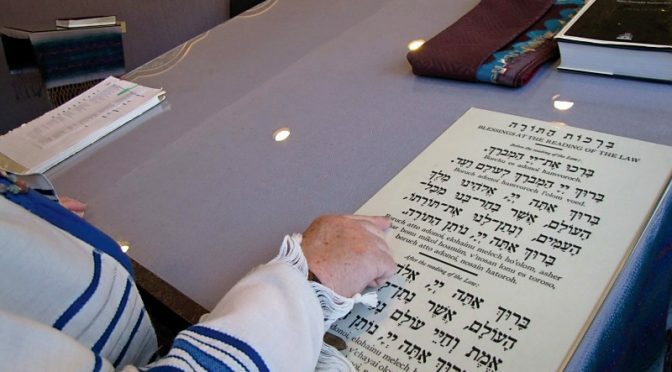 If you would like to revisit your haftorah from your bat or bar mitzvah, or you would just like to experience the joy and challenge of learning a new one, we provide a highly supportive environment in which you will receive generous personal instruction and instructional materials. Our “Torah with Laura” program is available as a valuable resource. We especially encourage the participation of teens! We have records of previous chanters and we know several congregants’ preferred portions, however it is advisable to request well in advance. Tapes, lessons and review sessions are also available—just contact Laura Cohen to arrange. Moreover, numerous online resources (such as these) are available for those wishing to review Torah readings and haftarot in the triennial cycle. We currently need chanters for the weeks where no name is listed. To chant a haftarah for your special occasion such as a Bar/Bat Mitzvah anniversary or yahrzeit, please call Laura Cohen at 908-389-1744 or e-mail Laura at laura.cohen@hpe.com.